The 13-Moon Short Guide is a compact booklet. 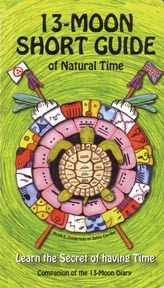 Learn all about the Tzolkin day energies and the 13 Moon Calendar with this colorful booklet. What is a GAP and Core day, how can you use it and how do you plan your activities based on the Tzolkin energies? Which day is a good day according to your birth energy and which day you better stay inside? All ins and outs are clear and concise explained. Start to calculate your horoscope and you will embrace this calendar forever. Good for all years. Imported from Holland. 13-MOON SHORT GUIDE Companion to the 13-Moon Diary By Nicole E. Zonerhuis and Sylvia Carriho. 102 pages. 5x8 Paperback. All Color Illustrations.